Developed with Chet Atkins in mind by master fingerpicker and Chet’s best friend, Mr. Paul Yandell. The Paul Yandell Duo-Tron is unique tonal experience, infusing steel blades and screws as pole pieces in opposite positions on the pickups. This provides exceptional string to string note separation and supplies a whole new character to the sound. 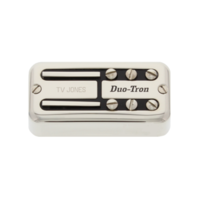 The Duo-Tron's proprietary design combines blades and pole screws to highlight the response of the magnet. The blades provide a bigger note and are well-suited for finger-picking styles. The player won't lose any sensitivity bending the treble strings and will notice a fuller, bolder response that affects both sound - and equally important – feel. The bass side dials in a tone directly reminiscent of Ray’s original Filter’Tron - but with a touch more dynamic attack that is a little more focused and rounded. The Universal Mount is a direct drop-in replacement for standard sized Filter'trons - with and without "ears" or “clips”. This pickup comes with two pieces of compression rubber, 2 mounting (wood) screws, and the Universal Mount Clip Pack which includes everything you will need to mount the pickups to your ring or pickguard. 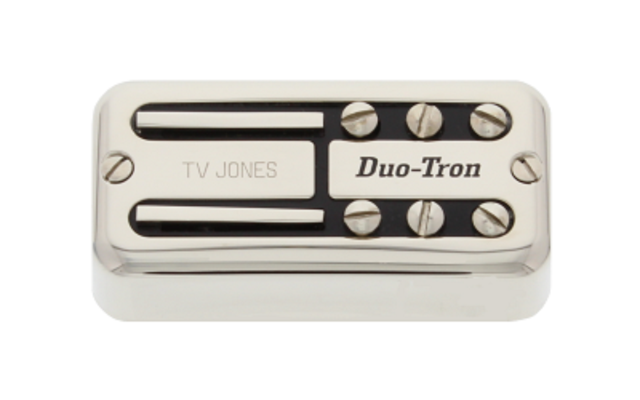 Splitting coils is generally not recommended with the Duo-Tron due to low coil output, although some may enjoy it. Additionally, the 4-Conductor wire is convenient for custom switching i.e. pickups combined in series or parallel.